Let’s see a show of hands from those who still think backroom politics is the stuff of Boy Scout Jamborees. I thought as much. We’ve been conditioned by both reality (read John Edwards) and pop culture (“Primary Colors”) to expect the worse from our real and pretend politicos. “It’s a dirty game,” we’re repeatedly reminded. And when you get down in the muck to play, you get up sullied, compromised. 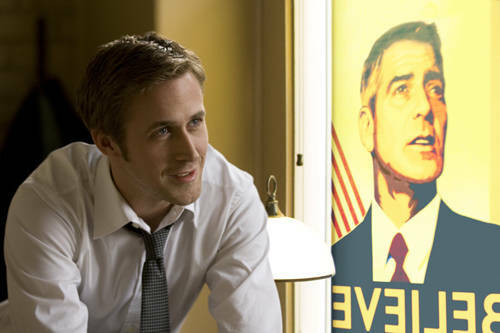 And so it is again in “The Ides of March,” a quasi-political thriller starring Ryan Gosling as press secretary for a not-quite-presidential candidate on the eve of the Ohio Democratic Primary. George Clooney, who also directed, plays the forthright, seemingly beyond reproach candidate, Pennsylvania Governor Mike Morris. Evan Rachel Wood and Philip Seymour Hoffman co-star as an ambitious young intern and Morris’s fatally upstanding campaign manager. If you know your Portable Shakespeare, you know what’s in store will have something to do with planting a knife squarely between the shoulders of a would-be Caesar. It will also chart the downward spiral of Gosling’s Stephen Myers, a cocksure campaign strategist who talks like a naive idealist but barters like a cold-blooded Machiavellian. He’ll do whatever has to be done to see Morris wins the nomination. Who cares if the married Morris behaves, after hours, like a skunk. At least on the stump he says all the right things. He’s a boilerplate lefty: pro-choice, pro-gay marriage, anti-death penalty … an advocate for higher taxes for the rich. Cinching Morris’s liberal credentials, he’s near rabid about weaning the U.S. from Middle Eastern oil and gas-guzzling cars. “Let’s start a New Technical Revolution” is his familiar mantra. Little wonder Myers is “all goose-bumpy” when it comes to his boss. “You really have drunk the Kool-Aid,” sneers a stock smarmy “Times” reporter played by Marisa Tomei. “And it tastes good,” Myers replies with the least hint of a smile. “Ides” is a compact, competently directed feature with strong work by Gosling and particularly Hoffman, who, as the exhausted conscience of the piece, has one of those moments that cry “Oscar nomination!” As he proved with “Good Night, and Good Luck,” his docudrama about Edward R. Murrow, Clooney knows where to plant the camera and how to light a fire under a large ensembles. Sometimes, however, members of the cast are given their head and encouraged to turn in their specialty acts. This is especially true of Paul Giamatti, who plays the opposition’s campaign manager in his usual snarky, cat-that-swallowed-the-canary manner. 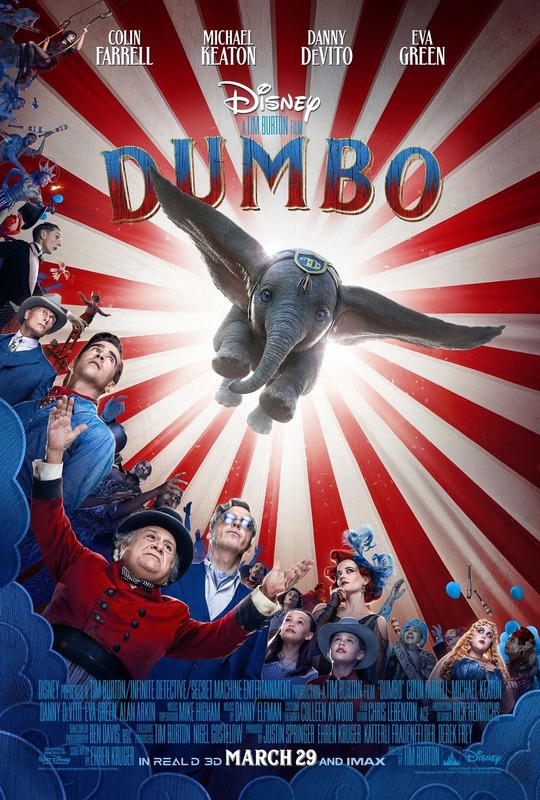 Structurally, the film betrays its stage roots (it was adapted from a play by Beau Willimon, who worked on Howard Dean’s presidential campaign). The plotting often feels too pat: People flip-flop from saint to sinner in the blink of an eye, usually following a showcase speech or, in Gov. Morris’s case, a secret rendezvous in a darkened kitchen. For a film by an avowed liberal, “Ides” couldn’t be more defeatist or conservative. Besides featuring a corrupt Democratic presidential hopeful ‒ whose campaign slogan rhymes with “I Like Ike” ‒ and his equally corrupt “brain trust,” it takes a broad swipe at the party in general, even casting Jeffrey Wright as a senator who’s looking to shop his delegates to the highest bidder. Well, if the movie portrays liberals as corrupt, then that’s pretty accurate. There is no party more corrupt than the Democratic Party. Anyone who feels they can draw a “who is worse” conclusion between the Dems and the GOP is a hopelessly lost ideologue and part of the reason we are in the trouble we’re in as a nation. A for the review, seems ridiculous and intellectually dishonest to demand that Clooney function as a blind mouthpiece. Both his supporters *and* detractors make the mistake of assuming Clooney is a one dimensional thinker. He isn’t. He’s honest in his opinions and calls it like he sees it. Sometimes the truth hurts. ALL of DC needs to be flushed, not just one brand o blue or red puppet. This bias shown at the end invalidates the entire review for me. Wow! I have found you. I have searched for many years for a film critic I could trust.